HONG KONG, 1st March 2014 – Permanent Secretary for Education, Mrs Cherry Tse Ling Kit-ching JP, special guest Shelley Lee Lai-kuen GBS, OBE, JP, a VIP advisory board panel and distinguished judges were present at an inspiring award ceremony for the South China Morning Post and The Hong Kong Jockey Club’s returning Student of the Year Awards 2013, held at the Kowloon Shangri-la hotel today. 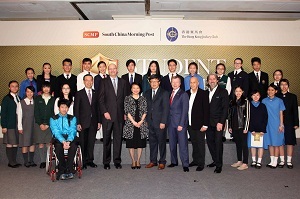 The Awards, first established by South China Morning Post in 1974, ran for 32 years until 2006, and were recently relaunched as part of their Celebrating Hong Kong initiative. Six categories, namely Grand Prize, Community Contributor, Sportsperson, Performing Artist, Visual Artist and three Linguist awards for English, Cantonese and Putonghua made up the new awards, which were made eligible for nomination from Form 4-6 or Year 10-12 secondary students across Hong Kong. The audience was treated to performances from the Performing Artist students, including a Latin ballroom dancer, a concert pianist and a Chinese opera singer. Impressive recitals were also given from the linguists, and a visual art exhibition was on display from the Visual Arts category. Mrs Tse remarked in her speech “I would like to applaud the SCMP. I’m sure in twenty years’ time, most of the illustrious persons of Hong Kong will be either your alumni or people who got the award…long live the awards.” Members of the advisory board Allan Zeman, Chairman of LKF Group and Ocean Park Corporation, Jay Walder, CEO of MTR Corporation, Paul Zimmerman, CEO, Designing Hong Kong, Robin Hu, CEO SCMP Group Ltd, and Winfried Engelbrecht-Bresges also attended and shared their thoughts and advice. “The entry level for the awards is incredibly tough and demands that only the best can even qualify as a nominee. Every single student that entered should be proud that they were the category best in their school” remarked Mr. Hu. Most of the 23 judges for the awards also joined in honouring the students at the ceremony, which was hosted before all the finalists and shortlisted candidates, their educators and parents. Each category was judged by an expert panel leader, a past winner alumni, and an expert editorial representative from the South China Morning Post. The process took six months of intensive preparation, culminating in nearly 500 nominations, and producing 24 finalists, each carefully screened with face-to-face group and individual interviews. Winner: Tam Pok-man 譚博文, from Sing Ying Secondary School. Winner : Tse Tsz-yan 謝芷欣, CCC Kei Yuen College. Runner-up: Claudia Tam Man-yiu, Island School. SCMP Group Limited (SEHK: 583) is a leading newspaper and magazine publisher in Asia. Its flagship publication, South China Morning Post, is Hong Kong’s internationally recognised English language newspaper and has the city’s most affluent and influential readership. First published in 1903, the newspaper has developed an enviable reputation for authoritative, influential and independent reporting on Hong Kong, China and the rest of Asia. Available in print, iPad™ and online through scmp.com and e-reader editions, South China Morning Post reaches a global audience with daily breaking news, analysis and opinion, multimedia articles and interactive forums. The South China Morning Post received 65 awards in 2013 for excellence in editorial, marketing and technical capability. Other titles in the Group include the Sunday Morning Post, the Chinese editions of Cosmopolitan, Harper’s Bazaar, ELLE, ELLE Men, Esquire and CosmoGirl!, HK Magazine, The List, Where Hong Kong, and Where Chinese玩儿.